Twenty-five veterans were honored Thursday afternoon in a special ceremony at the Hoosier Village Chapel. In an opening prayer, Hoosier Village Chaplain Ron May thanked those who served in the armed forces and those serving in public safety. He reminded guests that over this Memorial Day weekend, those families that have borne the loss of a loved one in service and the sacrifices of active and inactive veterans must not be forgotten. Last year, a Veterans Garden was added to the property with support from the non-profit BHI Senior Living Foundation, displaying bricks with 164 honorees’ names, branch and dates of service. Katrien Vanderbeck sang the National Anthem and God Bless the USA, as veterans and their families sang along. “It’s a pleasure to honor our veterans and years of service. We’re excited to add your names to the bricks at Veterans Garden,” said Hoosier Village Executive Director Mindy Kantz. All honorees are, or were, residents at Hoosier Village. Three served during World War II, two served during both World War II and the Korean War, eight served during the Korean War, and 12 served during the Vietnam War. As each of the 25 names was called, veterans stood to receive a medal and flag in appreciation for their service. Four of the 25 were given to the widows of late veterans. 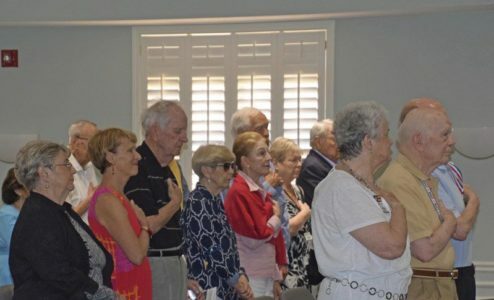 Several videos shown included the Veteran Garden Dedication ceremony in 2017, a Salute to Armed Forces and a Memorial Day tribute, ending with the playing of taps. After the ceremony, guests were shuttled by golf cart to the Veterans Garden to see their own or a loved one’s name permanently stamped on each brick. A representative from Indy Honor Flight was also on hand to accept applications. Indy Honor Flight takes veterans to Washington D.C. twice per year to visit those memorials dedicated to their service. May said a number of Hoosier Village residents have been on the honor flight and as a volunteer. The experience was one he won’t forget. Mr. and Mrs. Kelly of Spindletree found a visitor on their porch this past Sunday whose beauty is worthy of sharing. 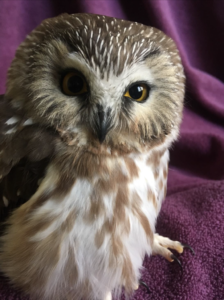 They also had a heartwarming experience with PROVIDENCE WILDLIFE REHABILITATION and wanted to spread the word to the Hoosier Village Community. Everyone please visit this facility’s website and contact them for any wildlife in need of rescue. One non-profit continuing care retirement community (CCRC) operator has quickly sold all of its newly constructed luxury duplexes, attracting a highly sought after population of younger seniors in the process. The provider, Indianapolis-based BHI Senior Living, believes this shows that seniors do not necessarily want to downsize as they age, and the senior living industry could benefit by building bigger. BHI recently sold the last of 30 newly constructed luxury duplexes at its 395-unit Hoosier Village community in Indianapolis. BHI has three other CCRCs in Indiana: The Towne House in Fort Wayne, Four Seasons in Columbus and Wesley Manor in Frankfort. The company also owns a 15-hole golf course located a short drive away from Hoosier Village. Each duplex at Hoosier Village has many of the same design features you’d see in a standalone single-family dwelling, such grassy yards, mature trees, front porches, oversized two-car garages, open floor plans and upscale kitchens. The homes represent a significant investment of roughly $14.5 million, with an additional $2 million going toward infrastructure such as roads and drainage. But that investment has paid off thus far, according to BHI’s president and CEO, John Dattilo. Part of the appeal of the big homes is that they offer everything one might have had in their pre-retirement dwelling, but with the added security and comfort of being part of a CCRC. Some of the duplexes even come with finished basements—a feature some other CCRCs have shied away from, Dattilo said. That focus on design and detail might be why the duplex’s residents are generally more affluent and younger than their counterparts in the CCRC’s independent living wing. Entry fees for residents range from $550,000 to $650,000. They also must pay a monthly service charge, depending on where they fall on the care continuum. BHI, which Dattilo described as a “very entrepreneurial” nonprofit, increasingly sees its future in bigger homes for more independent residents. Future plans also include a second dog park, garden areas, pavilions and nature trails.